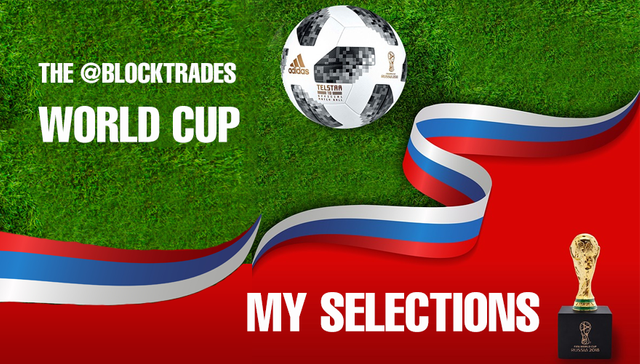 Today there is another small contribution from me for the @blocktrades Football World Cup competition. The phase is getting tighter and tighter and the games are getting more and more interesting. You are welcome to use the graphics I created for your contributions! Be quick, the deadline is today. Thanks to @anomadsoul & @acidyo and @blocktrades for making it possible to participate in this cool project. PS: This is an @acidyo & @anomadsoul organized contest, if you like the they are doing, vote for @ocd-witness as witness here. Congratulations! This post has been upvoted from the communal account, @minnowsupport, by louis88 🤘 from the Minnow Support Project. It's a witness project run by aggroed, ausbitbank, teamsteem, theprophet0, someguy123, neoxian, followbtcnews, and netuoso. The goal is to help Steemit grow by supporting Minnows. Please find us at the Peace, Abundance, and Liberty Network (PALnet) Discord Channel. It's a completely public and open space to all members of the Steemit community who voluntarily choose to be there.